February 5 ushered in the Year of the Pig according to the Chinese lunar calendar. But when it comes to screens big and small, perhaps 2019 should be branded the Year of the Dragon. The serpent-like creatures of legend are certainly having their time in the spotlight. Fans of HBO’s “Game of Thrones” eagerly await the final season of the fantasy epic in which dragons symbolize power, aggression and majesty. The computer-animated series “The Dragon Prince” unleashed its second season on Feb. 15 on Netflix. And while there may be no actual dragons featured in the episode, it seems fitting that William Shatner (almost a mythical creature himself) will make his first and only appearance on “The Big Bang Theory” in a Dungeons and Dragons-themed episode set to air in spring as part of the sitcom’s final season. But of all the dragons soaring into view this year it is Toothless, the endearing fire-breather from DreamWorks Animation’s “How to Train Your Dragon” series that has occupied a place in the hearts of audiences of all ages for nearly a decade. “How to Train Your Dragon: The Hidden World” is the third and final installment of the franchise and opens in theaters nationwide on Feb. 22. Already a hit in overseas markets, the film has generated $175 million in box-office returns since it began its international rollout in January. That places it ahead of “The Lego Movie 2: The Second Part”—which has a combined worldwide box office of $103 million—even before “Hidden World” bows in the United States and China (Mar. 1). The family-friendly franchise debuted in 2010 with the original film introducing a Viking teenager named Hiccup who dreamed of becoming a dragon slayer. Once Hiccup captures his first beast, a young dragon he eventually names Toothless, he realizes he no longer wants to kill it and instead befriends it. The pair returned in 2014’s “How to Train Your Dragon 2” and once again for the final chapter which sees them, both now grown, in search of a dragon utopia called the Hidden World. 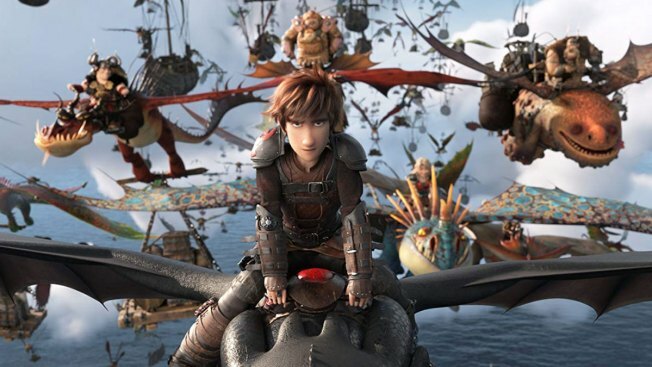 Actors Jay Baruchel and America Ferrera return to lend their voices as Hiccup and fellow Viking Astrid, respectively, under the assured guidance of writer-director Dean DeBlois who has helmed all three installments. Others in the voice cast include Cate Blanchett, Gerard Butler, Kit Harrington, Craig Ferguson, Jonah Hill, Kristen Wiig and F. Murray Abraham. A story of epic adventure on a flying, fire-breathing scale, the trilogy features thrilling scenes of heroism emotionally balanced by thoughtful exploration of the bonds of family and friendship. At its heart though is an age-old story about a boy and his best friend, and the responsibilities of pet ownership. Themes of inclusion and acceptance are also in the mix due to Toothless’ need of an artificial tail, and Hiccup himself having to come to terms with a prosthetic hand. So, as fans prepare to celebrate the fiery and destructive return of “Game of Thrones’” Drogon, Viserion and Rhaegal in this unofficial year of the dragon, it’s worth keeping in mind a kinder, more playful beast called Toothless, who in generating more than one billion dollars at the box office over three films, has proved to be anything but.